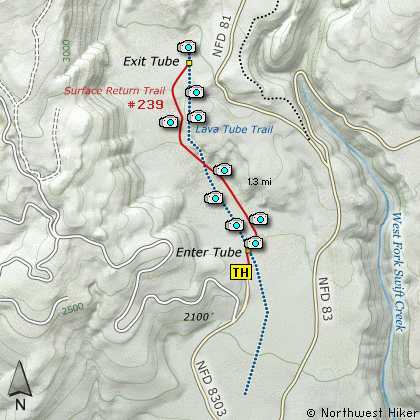 Here is one of the most unusual hikes available in the Gifford Pinchot National Forest. I will describe the hike as hiking up a lava tube know as Ape Cave, and returning via a surface trail. I must state that this hike is NOT for everyone. This cave is actually a lava tube, and is one of the longest such in the world at a length of 12,810 feet. It is said that the cave was discovered by members of a youth group known as the St. Helens Apes. Ape was a word referring to the mysterious legendary creature more commonly known as Sasquatch. It is believed that the lava tube was formed about 2000 years ago during the same eruptive event that caused the phenomenon seen at the Trail of 2 Forests, Hike #46. Being a lava tube, Ape Caves is entered at a point where you can decide to go uphill to an exit over a mile away, or go downhill for a relatively short distance, to at dead end, thus a need to back track to your place of origin. For this description, I will choose to take the longer more difficult option. 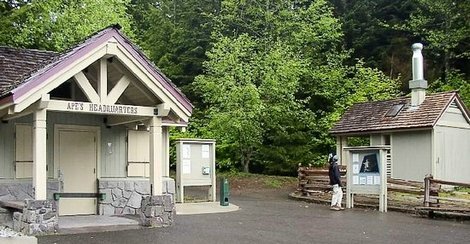 The trail head is located at a developed parking area off Forest Road 8303. The trail is paved to the opening of the cave. There is a substantial iron stairway in place to get you into the cave. You MUST make certain preparations to do this hike successfully. You MUST have adequate lighting with you. Not just one light, but 2. You must have a backup light, because there is absolutely NO LIGHT in this cave. Also, you would be very wise to dress warmly, as it is always in the 50s in the cave.... no matter the season. And by all means where very substantial footwear. The lava is extremely sharp and hard. Upon entering the cave, you will walk along a iron stairway that takes you to the bottom of the cave. At that point you have 2 options. For this description, I choose the longer, more difficult hike which heads uphill for over a mile. This unique hike up an ancient lava tube takes you over many piles of sharp cutting lave boulders. At times the ceiling will be over 20' above you and at times you will need to be careful not to hit your head on the sharp lava ceiling. These piles of lava rubble are left over from when the ceiling collapsed ages ago. As you make your flash lighted way up this lava tube, you will face one major challenge. About 2/3 of the way up this hike you will come to an 8 foot wall. Be warned, that the climb up this wall is NOT EASY. If you do not feel safe climbing this wall, then by all means, turn around and go back the way you came. In my youth I didn't even consider this wall a challenge, but now it seemed very difficult.... but I did make it. Eventually you will come to a place where there is a hole in the ceiling of this cave. Do NOT under any circumstances try to exit at this point. It is only a short walk to the iron ladder that will take you out of the lava tube and place you firmly on the top, where you just follow the clearly marked path back to the point where you began this adventure. From the junction with I-5 follow SR503 east from Woodland, WA approximately 23 miles to the junction of the Lewis River Road with SR503. Continue east on the Lewis River Road another 4.4 miles to the junction of Forest Road 81 just before you get to Cougar. Continue east through Cougar on the Lewis River Road, which becomes Forest Road 90, for about 7.4 miles to the junction of Forest Roads 90 and 83. Turn left on FR83. In about 1.7 miles you will come to Forest Road 8303, which leads to the Ape Caves. Turn left on FR8303 and follow it for about 1 mile to the entrance for the Ape Caves parking area.